What is a Mississippi Promissory Note? Mississippi Promissory Note: What Is It? A Mississippi promissory note is a written contract between the lender and borrower involved in a monetary loan. There may also be a co-signer who is a party to the contract. The purpose of the promissory note is to document the agreement and to act as a reference tool for the parties if questions develop. Mississippi promissory notes may be secured or unsecured. An example of a secured promissory note is a car loan. If the borrower doesn’t pay as agreed or follow the rest of the terms in the agreement, the lender can retrieve the vehicle. The vehicle acts as collateral for the loan. An unsecured promissory note does not involve collateral. The Mississippi promissory note must comply with both contracts law and, in some instances, securities law. The maximum amount of interest that may be charged in Mississippi may not exceed 10% per year or 5% over the federal reserve discount rate, whichever is greater. If there is no written agreement on interest, the maximum amount that may be charged is 8%. The creation date. Both the date of creation and the date that the document is signed play an important role in contracts law and if collections activities are required in the future. The identity of each party and their role in the agreement. Identify each party by their legal name and their role in the agreement. For example, Susan Q. Jones, Co-signer or Robert J. Doe, Borrower. The mailing addresses for each party. The mailing address for each party should be listed after their name and role. If the Mississippi promissory note is secured, it is advisable to list the physical address for the borrower and any co-signer. If the lender uses a separate address to process payments, that address should be identified and listed with the payment agreement. The initial amount loaned. This is the amount provided to the borrower without including the interest charged for the loan. It is important to make sure that the amount listed is accurate before the agreement is executed by the parties. The amount of yearly interest changed on the loan. This is the amount of interest charged yearly on the loan. It is expressed, usually, as per annum or annual percentage rate (APR). Payment agreement. 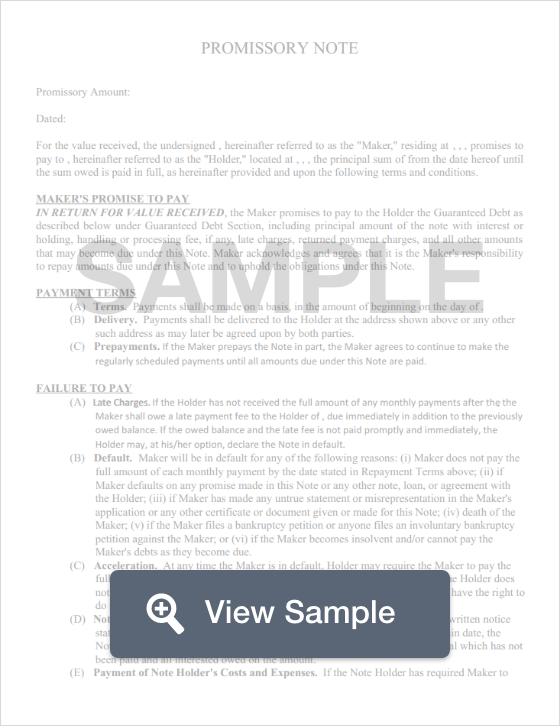 To document the payment agreement, the promissory note should list the number of installments needed to fulfill the repayment agreement, when each payment is due, the amount that must be paid, and whether there is a late fee. The late fee amount should be documented as well as when the late fee will be charged. If the Mississippi promissory note is secured, it is important to define the collateral that the lender may collect if the borrower does not fulfill the contract. Interest Due in the Event of Default. The contract may start out with a lower interest rate and increase if the borrower defaults on the agreement in some way. This clause lists the interest amount due if the borrower defaults. Payment Allocation. A payment allocation clause explains how the payments are applied to both the principal balance and the interest due. Prepayment. Prepayment is a term that means the borrower pays off the loan before the end of the stated term. This clause states whether the borrower will be subject to a financial penalty for prepayment. Acceleration. Acceleration is a term that means the lender has the legal right to demand immediate and full payment on the remaining balance if the borrower violates the agreement in some way. Attorney Fees and Costs. If the promissory note causes a legal disagreement, one or both parties may incur attorney fees and costs. This clause explains who is responsible for paying those fees. Waiver of Presentments. This clause explains to the borrower that they are still required to make payments even if the lender isn’t physically present. Severability. A severability clause keeps the rest of the agreement valid if one area is found to be unenforceable. Conflicting Terms. A conflicting terms clause states that if conflicting terms are found in the agreement, they will be resolved by the creation of an amendment that will continue to govern the agreement. Notice. A notice clause states whether the lender will notify the borrower if the lender plans to sue. Governing Law. A governing law clause lists the state whose laws will be relied upon for any legal disagreement resulting from the promissory note. A Mississippi promissory note does not need to be notarized. However, it should be signed and dated by both the borrower and co-signer.